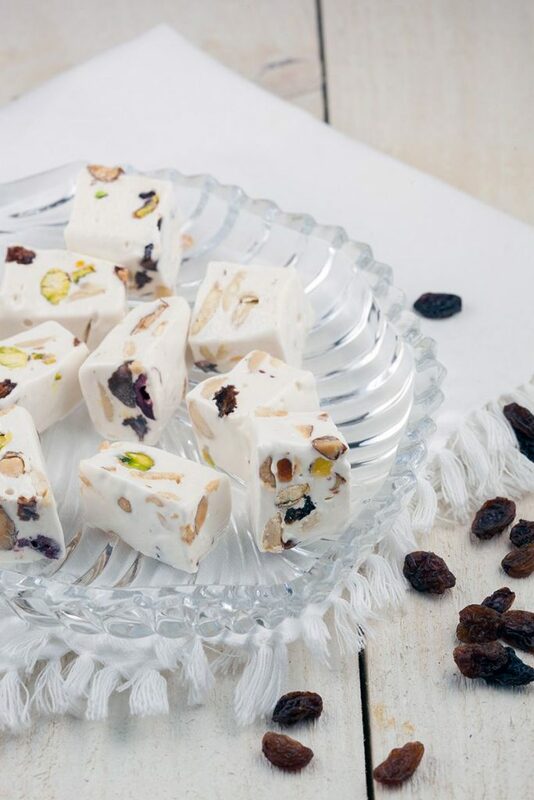 If you ever tried the chewy soft homemade nougat, you can't get enough and need another bite for sure! A real big of sweet goodness? You need this! First combine water, sugar, honey and glucose in the small saucepan. Tip: The easiest way to get the glucose from sticking to your spoon, is using a hot spoon. CLIP on the sugar thermometer onto the small saucepan. HEAT on medium-high heat and the sugar mixture will start to bubble and it’s ready when it has reached 128 degrees celsius or 262 degrees fahrenheit. This will take a while, especially reaching over 100 degrees celsius or 212 degrees fahrenheit. But it will get there, just be patience! HEAT up the oven to a temperature of 180 degrees celsius, or 356 degrees fahrenheit. ROAST the nuts in the oven for about 5 minutes, or until they’re lightly browned and smelling amazing and set aside. DEGREASE the bowl and whisk from your standmixer, use a few drops of lemon juice and a paper kitchen towel to do this. ADD the egg whites and beat them until they form stiff peaks. Gradually POUR the hot sugar mixture into the egg whites and keep on whisking on high-speed for 5 minutes. 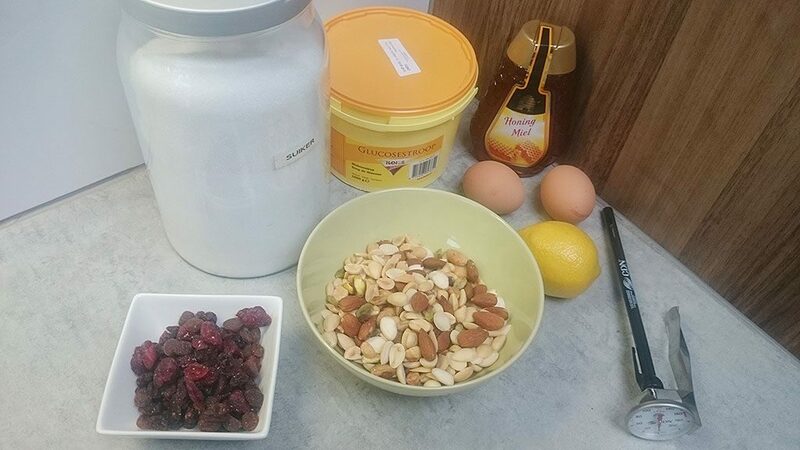 Switch to the paddle attachment and ADD zest of half a lemon, dried fruits and roasted nuts. Combine well and let it cool off slightly. PLACE a sheet of parchment paper on your work surface and pour the nougat mixture on top of it. WRAP it with the parchment paper and then a layer of cling film, to create a square. 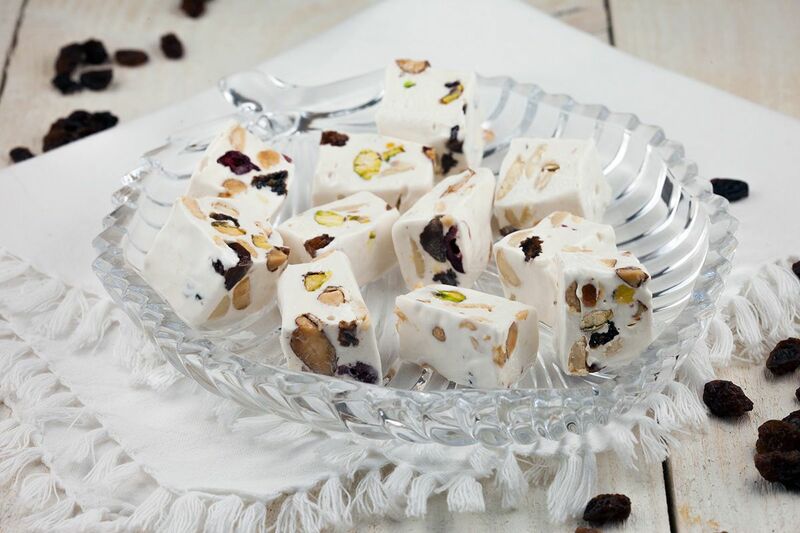 We prefer soft nougat and it makes it easier to eat it if you use edible sugar paper on the bottom and top. 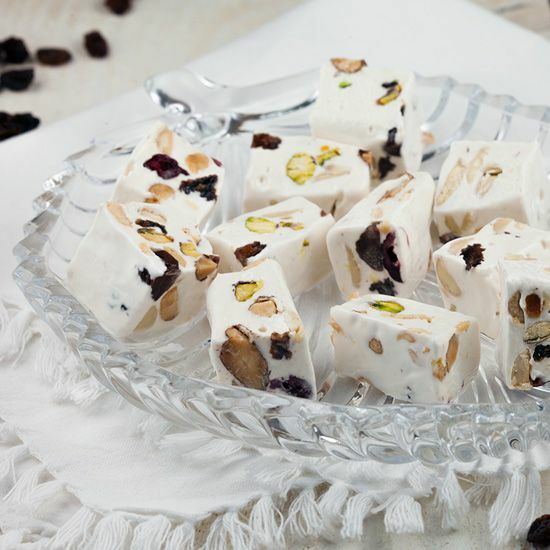 REFRIGERATE the nougat square overnight, now you can use a hot chef’s knife to cut the nougat into pieces. Enjoy! The commercial version is also VERY tasteful! We love nougat!